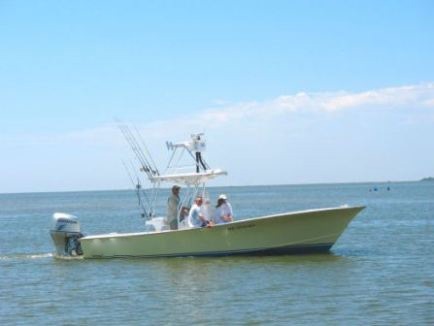 Come enjoy a day out on the water onboard the 27 foot Outer Banks custom built fishing boat "Fingeance" powered with a 250 Honda on a jack plate. Has a sight-casting tower for Cobia and Redfishing. All the up to date fishing tackle and electronics along with fish storage, livewell, and cooler to store your drinks and snacks in.We also have a bathroom on board when needed. We offer 1/2 and full day charters.Fishing license is included. We also offer Clamming, Sight Seeing, Dolphin Viewing, Night Fishing and Bowfishing. Come enjoy a day out on the water with us! Families are very welcome! Captian Joey VanDyke is a USCG licensed 6 Passenger captain and a member of the Hatteras Charter Boat Association. "Fingeance" is also pro staff for Temple Fork Outfitter fishing rods, Okuma fishing reels, Engel coolers, Z-man fishing lures, Grays Taxidermy and Pro-cure.